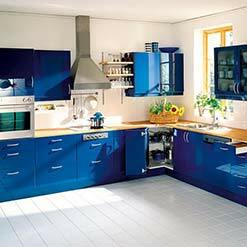 In Delhi and across India there are thousands of dealers who offer various deals on the modular kitchens. Many boast of manufacturing the parts themselves and hence they can give the best price. Others may argue that since they have a dedicated showroom to display the Modular kitchens, they would offer a price which would be competitive enough to challenge the vendors who rather appeal insignificant as compared to their designs and glossy finishes. But the customer must be smart enough to figure out the difference as the one who is displaying 10 kitches would keep a minimum margin of about 2-3 Lakh per kitchen. Even a kitchen which is their cheapest would be really cheap in quality with extremely. Low grade materials but even on that they would still keep no capping on their margins. You may refer to the consumer forums of couple of indian dealers boasting on big commitments. We must keep our eyes and minds open in selecting the correct price for our modular kitchen. Of course kitchens are made Once in 10 years but you never want to repent the 10 years for the price you paid or the vendor who burnt your pocket. We must understand that Perhaps the best deal one gets is when the dealer gives you a detailed 'bill of materials' , starting from a single screw to the products and fittings used. Always insist on getting a complete quote for your kitchen. Never get square feet estimates as those are the domains of street smart carpenters through which they tactical hoodwink you and always keep you in dilemma of measurement. Important thing to understand here is that There is no possibility of providing any quotes before the 6 steps of kitchen planning. Kitchen Planning includes couple of meetings with you and is different than the basic measurements and drawings. Kindly do not show any emotions to the quotes which are based as per square feet as they are simply bogus and must be dismissed immediately. Always go for kitchen planning quotations which provides you with an in-depth explanations on every space utilisation in your kitchen and shows accountability of every single screw used in your kitchen. We wish you luck in your journey to find the right price for your Modular kitchen. You can although Contact our project heads and team leader and we assure you ethical commitment with a well defined structure of work across India. But one must realise that there may be a kitchen as low as 75000 and as high as 35 lakhs. The difference though lies in the Budget as well as your kitchen planning meeting which generally takes place having indepth understanding of what you want and of which international brands.